A family name, Radeon HD, followed by a four digit number. With the exception of the X2s, AMD has stuck to its naming system without fault. In fact, AMD has done such a good job with keeping the names clean that things are the way they should be: the internal codenames are more difficult to remember than the actual names of the cards (e.g. RV770 vs. Radeon HD 4870). NVIDIA however, just hasn't gotten the hint. The GT200 launch gave us two simply named cards: the GeForce GTX 280 and GTX 260, but it didn't take long for NVIDIA to confuse the marketplace with the launch of the GeForce 9800 GTX+. I hoped that the naming silliness was limited to the older GeForce 9 GPUs, but today it extended into the GTX lineup. It's called the GeForce GTX 260 Core 216. 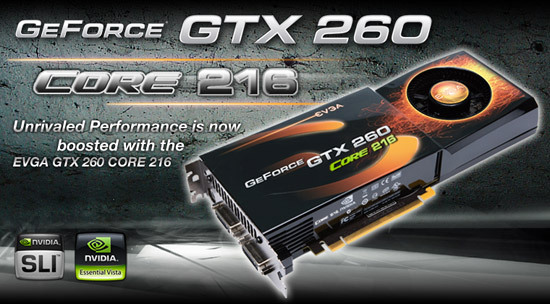 The GeForce GTX 260 Core 216's name is actually quite descriptive, albeit absurdly long. The GeForce GTX 260 part we already know from the GT200 launch, the Core 216 suffix just indicates that the GPU has 216 "cores" (also playing on Intel's new Core i7 naming for Nehalem, due out later this year). Why NVIDIA didn't just call it a GeForce GTX 265 or 270 is beyond me. To make matters worse, we'll see companies adding their own suffixes to the already extended name. For example, EVGA sent us their Core 216 called the EVGA GeForce GTX 260 Core 216 Superclocked Edition. Perhaps it's some conspiracy to increase the salary of writers who get paid by the word. 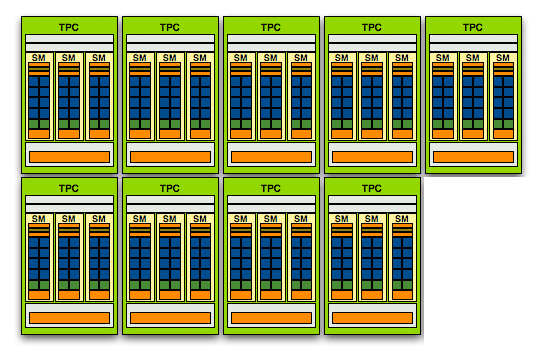 If you remember the diagram below from our GT200 review you'll see that a GeForce GTX 280 has ten clusters of 24 stream processors (the little blue blocks), for a total of 240 SPs or "cores". The GeForce GTX 260 has eight of those clusters (called Texture/Processor Clusters or TPCs), bringing its total up to 192 SPs. 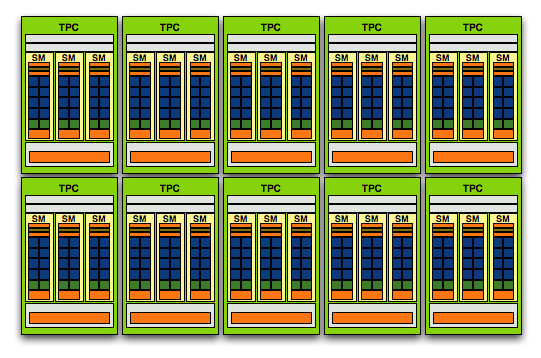 The Core 216, as you can guess, has nine clusters or 216 SPs. NVIDIA just enabled another TPC on the Core 216 (or alternatively, disabled a TPC on a GTX 280). 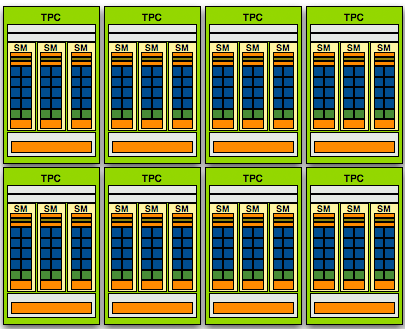 The extra TPC also gives the Core 216 another 8 texture address and filtering units, but the rest of the chip's makeup remains the same, even down to the clock speeds. The Core 216 runs its core, shader and memory clocks at the same frequencies as the vanilla GTX 260. Priced at $279, the Core 216 is a direct competitor to AMD's Radeon HD 4870 - selling at a similar price. The GTX 260 will continue to exist although selling at a cheaper price point and naturally with more processing power, the GTX 280 remains unaffected. I think this card was a knee jerk reaction that NVIDIA should have passed on. It was a waste of resources, they had plenty of time to blow AMD out of the water since the 8800 but fell asleep at the wheel. This move seems like a petty attempt to put their card on equal footing at best. How about HDMI, display port, DDR4, something significant, etc. I like NVIDIA but they have to step up, not waste resources or shelf space with something that can only even the playing field, and not even at a price point. I think this product was a poor decision and a waste of resources when all focus could have been getting put into proper future products. This review was decent enough, I don't think much more effort was necessary to spend reviewing a product that didn't bring much to the table. "I think this card was a knee jerk reaction that NVIDIA should have passed on. It was a waste of resources, they had plenty of time to blow AMD out of the water since the 8800 but fell asleep at the wheel. This move seems like a petty attempt to put their card on equal footing at best. How about HDMI, display port, DDR4, something significant, etc. " You're kidding right ? So what you're saying is that nVidia should just toss out their defective 280 GPUs to "not waste resources" ? Of course I am guessing that this is what is actually going on, but it makes perfect sense to me that NV try and recover what they can cost wise. "think this card was a knee jerk reaction that NVIDIA should have passed on. It was a waste of resources, they had plenty of time to blow AMD out of the water since the 8800 but fell asleep at the wheel. This move seems like a petty attempt to put their card on equal footing at best. How about HDMI, display port, DDR4, something significant, etc. " Why is there no longer video reviews on these cards ? Like a subjective review on how they do playing video, and cpu usage and such ? I miss seeing this info ! Please start including it again, as it is a factor in my purchases. the 260 core 216 (OMG what long and senseless name! )competes with the 1GB version of the 4870. I am really inclined to believe that ATI is paying sites to review the 1GB version of 4870 at 1920x1200 or lower resolutions to avoid losing 4870X2 sales. "With our ET:QW bench, at 2560x1600, the Core 216 adds enough horse power to pull the NVIDIA card up to a tie with the 4870. Yes, there is a tenth of a frame difference here, but that's well within margin of error." But at both previous resolutions of 1680X1050 and 1920X1200 the 216 falls to the 3870 by 13% and 9% respectively. Yes once you get to the ungodly resolution of 2560X1600 (which I may ask why? since these are not high-end parts?!?) they pull even, but up until that point it's a pretty sound beating for the 216. "With our ET:QW bench, the 216 falls by double-digits to the 3870 at lower resolutions, but at 2560x1600, the Core 216 adds enough horse power to pull the NVIDIA card up to a tie with the 4870." That is a fully accurate summary that allows someone to get the gist of the data without having to trace all the broken-line graphs. One other little favor to ask. Could you please, PLEASE, keep the colors consistent between the line and bar graphs? On several occasions I was following the wrong line because the green bar is a different card than the green line. I'm sure it would take only a couple minutes, but it would really help the reader quickly go from chart to chart to see how a particular card fares at the reader's native resolution.